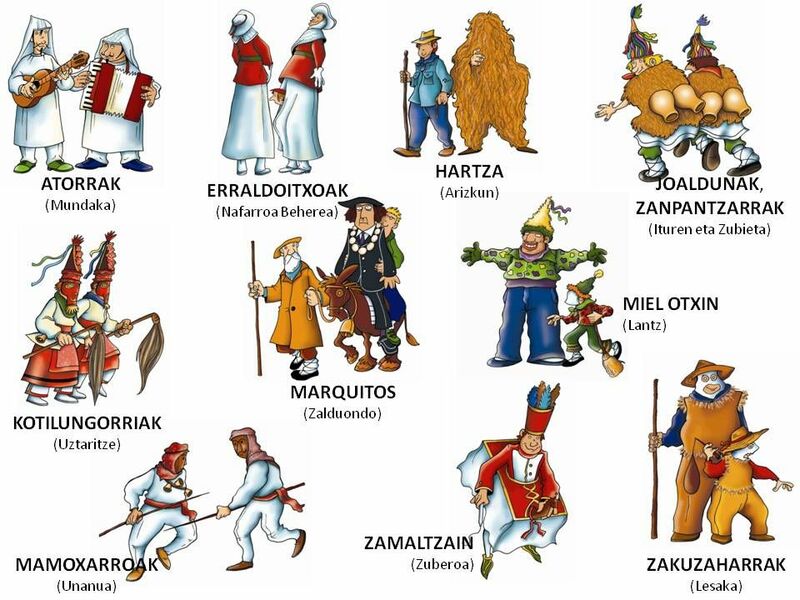 Given the importance of the oral tradition in Basque culture, we thought it would be a great idea to examine Basque history through the words of ordinary people whose lives and experiences make up that history. The port of Donibane Lohizune, Lapurdi. Photo by Haukingham, courtesy of Wikimedia Commons. Today we share a cautionary tale of witches, devils, the evil eye, and seafaring superstitions in general, as recounted by Xan Alzate in his marvelous Paroles de pêcheur: Mémoires d’un mousse dans les années 1940 (A fisherman’s words: Memoirs of a cabin boy in the 1940s, 2008). Xan was born in Donibane Lohizune (Saint-Jean-de-Luz), Lapurdi, in 1928. His father, Pantxoa Alzate, was a mechanic at a local fish-canning factory and a sailor while his mother, Maria Chauvel, was a Breton from Morbihan who had come to the town at age sixteen to work in a fish canning factory there. Fishermen in Donibane Lohizune, c. late-19th-early-20th century. Image courtesy of Wikimedia Commons. I was thirteen and one-half years old, I weighed no more than ninety pounds on rainy days, and if I made it to five feet tall it would have been a big deal. Nevertheless, I did have some assets: indefatigable, a hard worker, sturdy despite my tiny frame, my father had taught me to work hard, [and] I didn’t want to disappoint him. They were superstitious. The first or second day—I don’t remember exactly—of my time at sea, I was happily whistling, when someone took my by the ear, shook it slightly, and whispered into it that the wind was big enough to whistle at sea, that it didn’t need any help from me. Don’t whistle anything that may bring on a storm. I also learned about a few things that brought bad luck, which were forbidden. No rabbit in the billycan. The word “rabbit” was banned on board, replaced by “big ears.” Aña, do you keep any “big ears”? But “rabbit” banned. Also banned, chestnuts, walnuts. With such nuts on board, we were sure to come back empty-handed, tear the fishing net, or encounter all manner of trouble. It would never occur to them to set sail for the first time on a Friday. Beginning the fishing season on such a day, we could expect the worst kinds of disasters. I listened, I believed, I trusted them, I respected the traditions. When no fishing was done, when a day unfolded full of incident, they looked at me in strange way, saying loudly: “There’s someone here who sleeps with his mother!” Of course, they said that to have a good laugh. They loved stories about witches, mysterious tales, they loved anything whimsical. My favorite osaba [uncle] used to tell me dozens of stories; he kept me in suspense right till the end. To finish up, he used to say: “These are true stories, it isn’t fiction, it’s from real life in the old times, people don’t remember any more, my great-amatxi [grandmother] saw all this, it was she who told me.” I wasn’t going to question the word of his great-amatxi. Those sailors used to see the devil everywhere, they mistrusted the evil eye. Yet they weren’t afraid of anything, they faced up to the elements with a flawless courage, they laughed at life’s ups and downs, they got really angry about any kind of injustice; they forgave, but they didn’t forget. Basque Culture: Anthropological Perspectives, by William Douglass and Joseba Zulaika, is a great introduction for anyone seeking to understand this world. Chapters 13 and 15 deal with Basque fishing while chapters 18 and 19 deal with folklore and mythology, on the one hand, and witchcraft, on the other. This book available free to download here. there is no cause-and-effect relationship between willingness to work and outcome. Fishermen also believe that there is a gap between the human and the natural orders that cannot be bridged by sheer effort alone. Rather, much depends on chance, a probability that is categorized as luck—“good” or “bad.” Thus, there is a sense that it is the fisherman who, by means of his luck, rather than his dedication, mediates between the two otherwise unbridgeable orders. Humorous, sardonic, self-reliant men live there, lean from their war with the elements, ready to share their wine with any stranger . . . Their life is rigorous to the point of austerity and sometimes of hardship; but there are a hundred things to make it worth wile. There is no trace of depression or wage-slavery in the brine-cured and weather-beaten faces under those threadbare caps. The expression is wary, energetic amused and friendly and their demenour is a marine compound of masculinity, independence and easy-going dignity. The distinctive limestone peaks of the Urkiola Range, Anboto is the peak farthest on the right. From the hamlet of Urkiola. It’s December again and I can’t believe it has been a whole year since I was last in the Basque Country! Since I wasn’t able to go this year, I’ve been fondly remembering my last time there, especially my last day there, a Sunday when my coworker and his partner offered to take me on a long-desired visit to Anboto. The mountain dominates the skyline of Durango and, just as a hiker looking up at it on breaks from the Azoka Stand, I’ve always wanted to make a shot at it, so I jumped at the chance. Although Anboto is actually lower in elevation than Reno at around 4,370 feet (Reno stands, according to Google, at 4,500 feet), it stands out from the landscape as an overpowering juggernaut. It is an immense mass of limestone, with cliff faces of 1,000 meters (roughly 3,000 feet) over Atxondo Valley. Anboto is one of the most known and most characteristic summits of the Basque Country. Looking south from Urkiolamendi Pass at the beginning of the true peak ascent. 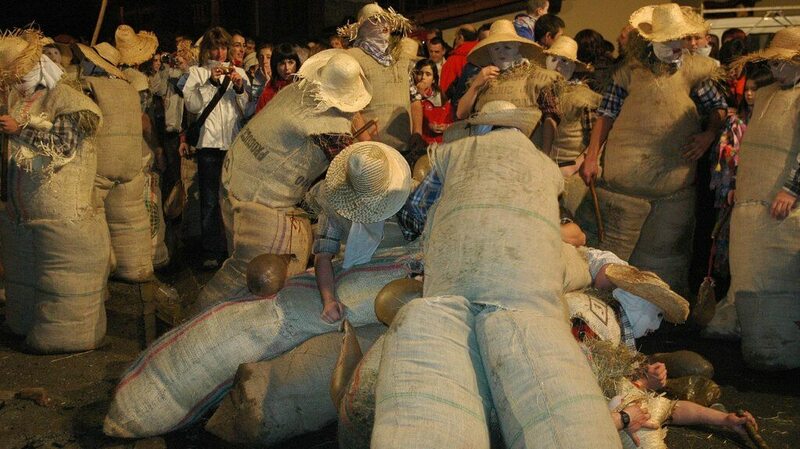 It is easy to understand the grip the mountain has had on the Basque imagination. 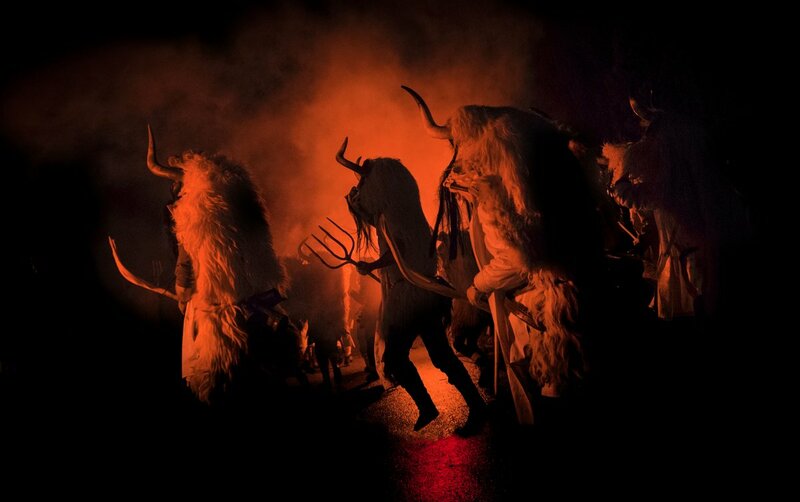 With its distinctive shape, Anboto is not only easily recognizable but it has always played a role in Basque mythology, most famously as the home of Mari, the Basque goddess who is said to control the weather. She is said to live in a cave on the front face of the mountain. She is also known as Anbotoko Mari (“the Lady of Anboto”), She and the god Sugaar were (also known as Sugoi or Maju) connected her to the weather. When she traveled with Sugaar hail would fall. And in general her tos and fros across the sky brought storms or droughts. Mari was said to control the weather from her cavern on Anboto. We left the car at the hamlet of Urkiola, in the Parque Natural de Urkiola, alongside the Sanctuary of Urkiola, a Roman Catholic temple that famously celebrates the Day of Saint Anthony of Padua on June 13. This saint helps those looking for lost objects and for love, but we needed nothing as we started off on a crisp December morning with mountains dotting in and out of thick fog. The walk is a popular one and we passed many other strollers and even some Basque ponies or pottoka. A wild Basque pony, clearly used to passersby and photo opportunities, similar to Reno’s local mustangs. It was so pleasant walking and talking with my coworker and his companion, who have also become my good friends over my years working as your Basque Books Editor. Once we get past the fog layer the day is clear and bright, an anomaly for the Basque Country in this time of year and we soak it in. At Urkiolamendi Pass my companions, having been here many times before, decided that they would forsake a summit attempt and they sent me on alone. Now the trail became braided into various use trails and, with the beautiful day and with the Basques’ love for the outdoors, hiking, and mountain climbing, there were many people on the pass. Climbing up through steep limestone, at first the trail remained in the treeline, but it was truly stunning when it emerged and you could see how very steep this mountain really is. That is a long way down! I emerged onto the top of the ridge to a sublime panorama of what seemed to be the entire Basque Country. Durango in the valley below me, farther away toward the coast where Gernika was, and then, over there, even where Bilbao would be although it remained out of sight. Emerging onto the highest ridge, looking toward Durango and Bilbao. The last climb to the summit, dotted with people. I started climbing the last, narrow, very steep climb to the summit. I think that maybe Mari go to me, or Sugaar, because I started to get really nervous. My more or less street shoes didn’t seem to be finding the traction they should on the still dew wet grass and the number of people (in Nevada it is much more common to hike alone) made me feel claustrophobic. Particularly one couple, with the man convincing an increasingly reluctant woman that she should continue while younger, fitter people clambered all about us. I was probably only meters from the summit when I realized that it didn’t matter so much, that I had done what I had set out to do and that it was time for me to get off of the mountain without officially having stood on its summit. My companions, a txakoli, and lunch would be awaiting me down at the bottom, while there was only the wind and myth and fate left on the summit. So I retraced my steps. Rejoined my companions for an excellent lunch in Urkiola, and left Anboto behind for another year. I’ll be back!!! Happy holidays and New Year to all of our blog readers. Thanks so much for following along with us and for staying abreast of what is happening at the Center and in Basque culture. Here’s looking forward to 2017! 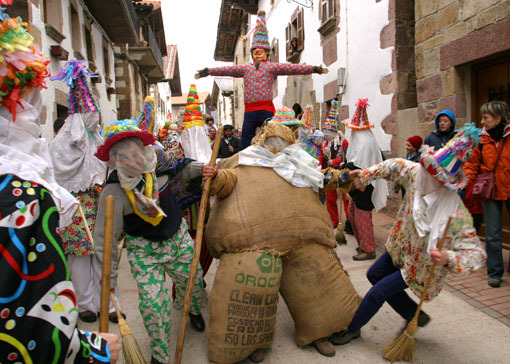 In a previous post we discussed the importance of the solstice festival, St. John’s Eve, and today we’re going to talk about the seemingly humble sunflower–eguzki-lore (flower of the sun) or ekilore (flower of the east) in Basque. 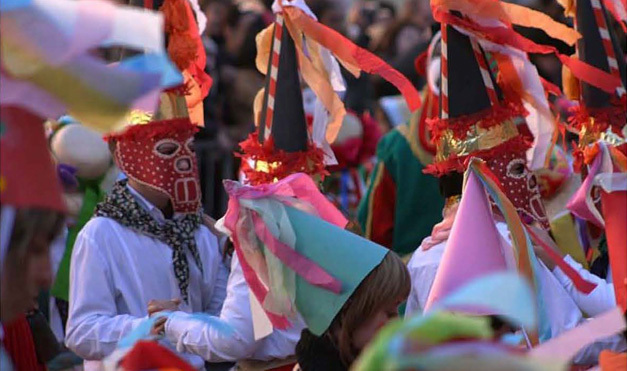 This is an important symbol in traditional Basque culture that, like the St.John’s Eve festivities, is rooted in a more general solar mythology that once extended across Europe as a whole. Carlina acaulis. Image by Bernd Haynold, courtesy of Wikimedia Commons. Clearly, as its name in English also suggests, the sunflower resembles the sun, but why is it so important in traditional Basque culture? First of all, it is important to comprehend just how important the sun was. Understandably, people venerated the rising sun as a giver of light, and life, the very means to their daily survival. Prehistoric dolmens generally face East, toward the rising sun, as do (where possible) most traditional houses and old tombs in the Basque Country. In the latter case, there is also a practical dimension to this because typically the cold and rain come from the North and West respectively. there seem to exist affinities reflected in the language among the ideas of light, sun, and fire. All of this may have had a religious meaning that is lost today. However, the custom of greeting the sun (and the moon) both at their rising and at their setting has been conserved until the present by children and even by adults in some towns. These greetings are notable because in them the star of the day is treated as a grandmother and is therefore female, which also occurs among many Indo-Germanic peoples. Some old stories (particularly one from Errigoiti [Rigoitia]) seem to suggest that some people believed the earth to be the mother of the sun. Specifically, in Errigoiti (Bizkaia), Barandiarán tells us, they used to say “Eguzki santa bedeinkatue, zoaz zure amagana” (Holy, blessed sun, go to your mother). Dried sunflower nailed to the front door of a farmhouse in Senpere, Lapurdi. Photo by Garuna bor-bor, courtesy of Wikimedia Commons. If you’re interested in traditional Basque mythology, be sure to check out the abovementioned works: Julio Caro Baroja, The Basques, and José Miguel de Barandiarán, Selected Writings of José Miguel de Barandiarán: Basque Prehistory and Ethnography. On May 22, 1920, Basque composer Jesús Guridi‘s opera Amaya o los vascos en el siglo VIII (Amaya or the Basques in the eighth century) was performed for the first time at the Coliseo Alba opera house in Bilbao. The premiere starred Spanish soprano Ofelia Nieto in the title role, Polish soprano/mezzo-soprano Aga Lahowska, Basque tenor Isidoro Fagoaga, Italian bass-baritone Giulio Cirino, and Basque bass Gabriel Olaizola as well as the Bilbao Choral Society (conducted by Guridi himself), with music by the Barcelona Symphony Orchestra, conducted by Ricard Lamote de Grignon. It is an opera in three acts and an epilogue. The Spanish libretto was written by José María Arroita Jauregui, with a Basque version by Brother José de Arrúe. The opera was based on a Romantic historical novel of the same title by Francisco Navarro Villoslada, originally published in journal installments from 1877 onward, which combined elements of Basque folklore, mythology, and historical fact. The setting is Navarre in the eight century and the plot surrounds a twofold power struggle: on the one hand that of Basque pagans and Christians, and, on the other, a more earthly conflict among Basques, Visigoths, and Muslims, in which the noblewoman Amaya, the descendant of the Basque ancestral patriarch Aitor, is the central character. She ultimately marries the Basque resistance leader García/Gartzea and together they establish the royal house of Navarre. Jesús Guridi in 1915. on the occasion of a performamce of his opera Mirentxu in Madrid. Courtesy of Wikimedia Commons. Embracing a Wagnerian aesthetic and clearly rooted in Basque folklore, Guridi gave each character in the opera their own melody, rhythm, and instrumentation. Thought and structure coincide completely in the work, which proved a triumph for the composer from Araba, earning him a great reputation for his attention to dramatic composition. His other Basque-themed works include Mirentxu (1910), El caserío (The farmstead, 1926), and Diez melodías vascas (Ten Basque melodies, 1940). Curiously, he was also the author of Homenaje a Walt Disney (Homage to Walt Disney, 1956). He died at the age of seventy-four in 1961. If you’re interested in this topic, check out Basque Classical Music by Karlos Sánchez Ekiza, free to download here, courtesy of the Etxepare Basque Institute. Be sure to also take a look at the website of the marvelous Basque music archive, Eresbil, which features a comprehensive record of all kinds of Basque music, musicians, and composers, and at which you can listen to original recordings, download scores, and so on. One of the towering figures–both literally and figuratively–of the Basque cultural world, Nestor Basterretxea, was born in Bermeo, Bizkaia, on May 6, 1924. Although renowned for his work in sculpture, alongside the two Basque giants of the art form, Jorge Oteiza (1908-2003) and Eduardo Chillida (1924-2002), Basterretxea distinguished himself in the Basque cultural arena for his wide and varied work in a number of different fields from painting and design to film making, as well as carving out a major commercial name for himself as an entrepreneur, and with his death at age 90 in 2014 he left a major legacy for Basque culture as a whole. Nestor Basterretxea at work. Courtesy of Wikimedia Commons. Although born in Bermeo, he was forced to flee the Basque Country with his family during the Spanish Civil War. Finding refuge initially in France, the outbreak of World War II once more forced the family to flee, this time to Argentina. As a young man in Argentina, alongside his studies in industrial design he also took an interest in painting and worked initially in the advertising industry, drawing up designs for publicity campaigns as well as exhibiting some of his own paintings as well. In 1951 he married Basque-Argentinian Maria Isabel Irurzun, and the couple went to live initially in Madrid. He became involved in the European cultural avant-garde of the 1950s, a member of the Equipo 57 (Team 57) experimental painters’ group, and eventually settled in Gipuzkoa in 1958. Thereafter, without giving up painting, he also began to study sculpture as he found in this a better means to express the concept of space. In 1966, he was a founding member of the Gaur (Today) an avant-garde artistic group also including (among others) Oteiza, Chillida, Remigio Mendiburu (1931-1990), Jose Antonio Sistiaga (b. 1932), and Jose Luis Zumeta (b. 1939), which in its short but highly productive existence became a leading force for cultural change in the Basque Country, challenging entrenched ideas about art and aesthetics. Poster for the film Ama Lur (1968). At the same time, Basterretxea was also taking an interest in film as another significant means of artistic expression. Together with filmmaker Fernando Larruquert (b. 1934) he made the documentaries Operación H (Operation H, 1963), Pelotari (1964), and Alquézar (1965). The two of them also later made their key work: Ama Lur (Mother Earth, 1968); a documentary film intended to celebrate the strength and resilience of Basque culture that faced multiple hurdles in overcoming the predominant censorship of the time in Franco’s dictatorship in Spain; and, incredibly, the first feature length film production produced and shot in the Basque Country since the Spanish Civil War. The iconic “Gurpilla” (Wheel) chair designed by Basterretxea in the 1960s. Besides this artistic work in the fields of painting, sculpture, and film making, somewhat remarkably Basterretxea also found the time to create a business empire, designing tables, offices, chairs, couches, lamps, chimneys, bar furniture, and even a chess set for his company BIOK. He had actually been designing furniture since the late 1950s, first for the H Muebles company owned by a great Basque patron of the arts, Juan Huarte. Seeing a gap in the market for contemporary designed and Basque-made furniture, Basterretxea later set up BIOK and its showcase store Espiral with a group of investors, introducing, for example, the bestselling “Gurpilla” chair, based on a curved wooden design, in the mid-1960s. Thereafter, he returned once more to strictly artistic pursuits, presenting arguably his most famous work, the Serie Cosmogonica Vasca (Basque Cosmogonic Series) in 1973. This was made up of 19 works, made in wood, showcasing Basque Mythology and included individual pieces like the goddess-like figure of Mari and Akelarre (Witches’ Coven). This collection is today housed in the Bilbao Fine arts Museum. Olatua (The Wave) in the port of Bermeo, Bizkaia. Photo by Telle. Courtesy of Wikimedia Commons. After a brief spell as an art adviser to the newly implemented Basque government in the early 1980s, he continued to produce emblematic sculptures throughout that decade and into the 1990s and 2000s: these included the Bakearen Usoa (Dove of Peace) in Donostia; Solitude, the National Monument to the Basque Sheepherder in Reno; the monument to the Basque saint, Francis Xavier, in Tokyo; Goldea (The Plow) in Tolosa, Gipuzkoa; and the monument to the memory of the Basque sailors who died in the Battle of Matxitxako (near his home town of Bermeo) against Franco’s forces in March 1937. Monument to the fallen Basque sailors at the Battle of Matxitxako. Photo by Telle. Courtesy of Wikimedia Commons. He won numerous prizes and awards throughout his long life and will be remembered fondly here at UNR, where his Orreaga held pride of place in the old Getchell Library before being rehoused in the new Mathewson-IGT Knowledge Center, as reported in an earlier post here. Basterretxea’s work is discussed in both Basque Culture: Anthropological Perspectives by William Douglass and Joseba Zulaika (available free to download here) and Beyond Guernica and the Guggenheim: Art and Politics from a Comparative Perspective, edited by Zoe Bray. Be sure to check out, too, a couple of other publications by the Etxepare Basque Institute that talk about the influence of Basterretxea in different fields: Architecture and Design by Peio Aguirre (free to download here) and Basque Cinema by Joxean Fernández (available free to download here). The original entrance gates to Hacienda San Francisco Teacalha just outside of Dzidzantun. Photo by Byron Augustin (with permission). A few months ago we published a post on surprising sightings of the lauburu, and we were recently made aware of a series of great articles, at the Yucatan Living website, about further sightings of this iconic Basque symbol outside the Basque Country. Hacienda Santa Maria with Ron and Dee Poland standing between the lauburu-adorned gate posts. Photo by Rebecca Augustin (with permission). By part III of this series, the focus actually shifts to the Basque presence in Latin America more generally and here at the Center we’d like to encourage our readers to check out these fascinating stories and we congratulate Byron for his outstanding contribution! Hacienda Yaxcopoil. Photo by Byron Augustin (with permission).